Hello friends! Can I please recommend the Scottish Highlands to you for the perfect stout drinking, whisky sipping, cozy afternoons by the fire kind of holiday? This Christmas Matt & I went to Scotland to meet up with his older brother Adam and his Scottish wife Louise. They brought the kids over from Australia, so Matt, his twin brother Sam (who lives in Dublin) & myself couldn't miss the chance to meet up with them while they were over here on our side of the world. A little confusing, yeah? Whatever... a family Christmas in Scotland! 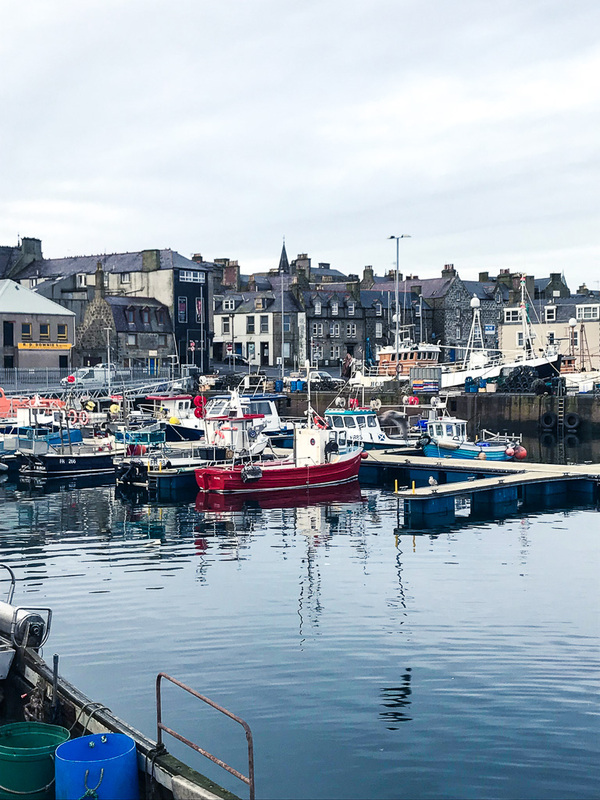 After spending a few days celebrating Christmas in Fraserburgh on the north east coast with Louise's family, Matt & I headed back to Aberdeen for a night and then picked up our rental car from the airport and hit the road! We headed north west from Aberdeen towards Inverness, driving through cute little towns along the way and getting really excited for what was to come. We hadn't planned where to stay, and Inverness seemed like a much bigger city than we were expecting, so we kept on going and started to make our way through the mountains to the little fishing town of Ullapool. (It was recommended to us by one of Matt's best friends, who's Dad is from there #GeorgeHobbs). The town was beautiful to pull into shortly before dark with the lights shining on the bay, we were feeling pretty excited about getting settled in here for the night. We poked our heads in the first pub we saw and we're directed to the Royal Hotel to stay for the night. Although there are lots of B&B's in town, it was getting a little late and a few were already booked up. The Royal Hotel was a bit pricer than we'd hoped, but HEAVENLY with a big bed with crisp white sheets and a beautiful view out to the bay. The hotel bar has an awesome selection of 267 different whiskies and a very knowledgeable gentleman serving us some delicious drops. For dinner we headed to Ferry Boat Inn where we spent the majority of the next two days parked in front of the fire in the pub, drinking stouts, playing dominoes, doing a little work on the computer, eating fish pie, fish stew, sticky toffee carrot cake pudding and of course, drinking a few whiskies. We loved this little spot so much that we decided to stay our second night in a hotel room above the pub. It was the perfect little room with a beautiful view. All the hotels we stayed at included a full Scottish breakfast (with a decent vegetarian option) as part of the stay, but this spot was definitely a favourite. On our second night in town we heard there was a quiz night at the The Arch Inn just down the main drag, so we headed there with an English couple we met. We ate fish & chips and drank lots of Tennents, and did terrible on the quiz. But it was FUN! We loved Ullapool and could happily still be there sitting by the fire right now, but we decided to keep moving after a couple of very relaxing days. So we got in the car and headed up north towards the little town of Scourie. The drive was BEAUTIFUL. Snow covered mountains, ruins of castles, lots of elk wandering the mountain sides. It was super cold, but really stunning. Tons of photo opportunities while trying not to be blown away by the icy wind. As we got to the tiny town of Scourie, we drove down from the mountains and out to the rugged coastline. It was stunning, but this time of year things are quiet. The restaurant in town was closed for winter, and the little pub didn't open until the evening. So we bought haggis & chicken pie and a stout from the convenience store and ate our little lunch while sitting in the car overlooking the water. If you haven't had haggis, it's really delicious and you should try it. A savoury pudding with sheep's heart, liver and lungs, minced with onion, oatmeal, suet & spices. Sounds delicious right? It actually is. Anyways, unfortunately not much else seemed to be happening in Scourie and as it was getting dark soon, we decided to make our way to Dornoch on the east coast of the Highlands. Matt was on a mission to visit a whisky distillery the following day and there are few nearby to Dornoch. We arrived in Dornoch after dark, but it looked like a really cute town. We found ourselves a nice room at The Eagle Hotel and then headed to the Dornoch Castle Hotel for dinner. Matt started with an IPA and I had a glass of prosecco. We shared calamari and then both had the fish & chips which was delicious. Finished it off with a sticky toffee pudding and an espresso for me (big mistake, zero sleep was had!). Afterwards me moved to the beautiful front room with the bar and sat by the massive fire. Matt had a few different whiskies, while I moved on to a local organic gin on the rocks with orange zest and rosemary. It was MAGICAL. As we were visiting over the Christmas holidays many of the local whisky distilleries were closed, but we did end up at Glen Ord Distillery in Muir of Ord on the way back toward Inverness. We went on a really cool tour where we got to see the whole process from malting & milling the barley, smoking the peat, mashing barley and water, fermenting it into beer, then distilling it into a clear spirit, finally maturing it in sherry and bourbon oak casks where it will age for 3 to 25 years, and even longer. We had a little tasting at the end and left with a bottle of Caol Ila (our new baby), a beautiful smoky whisky. 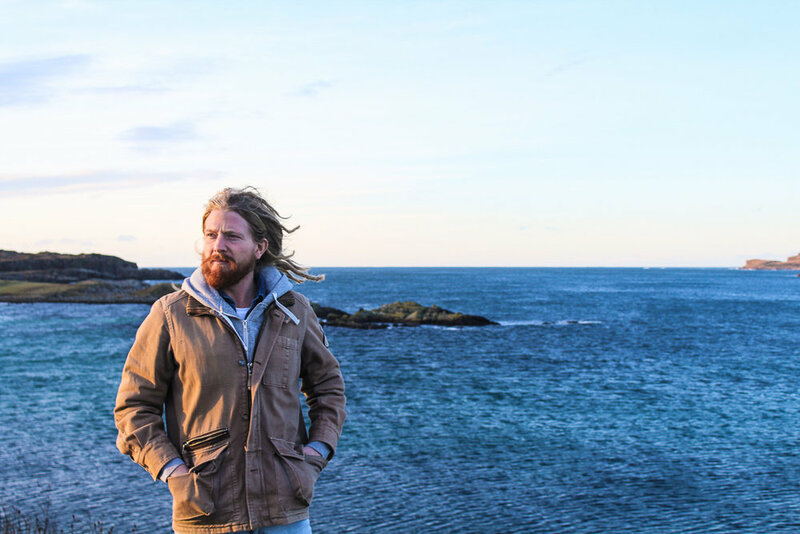 Once Matt had taken in all the booze-making knowledge he could, we started making the drive back to Fraserburgh up along the coast going through the little towns of Cullen and Banff. Although it was dark, these towns looked really cute to visit. We made our way back to Fraserburgh for one last get together with Adam, Louise & the family. Fraserburgh is a pretty cool town, with a really spectacular beach and grassy sand dunes. Right on the beach there's a great spot to have coffee and Scottish breakfast or lunch called Tiger Hill Cafe. We watched a few surfers out in the waves, wandered around the fishing harbour and poked our head in a small town pub for a beer. We stayed at The Saltoun Inn which had nice rooms and a comfy pub downstairs. The best part: our time in Fraserburgh involved a few really delicious home cooked meals, my favourite! On our way back down to Aberdeen Airport we stopped in Ellon for a final chips, gravy, curry sauce, cheese, haggis pudding, Irn Bru FEAST. We certainly went out with a bang. It would have been awesome to check out BrewDog DogTap in town, where the popular Scottish beer brand BrewDog is based these days. Apparently they have a tap room and restaurant, as well as tours of the brewery. But it was closed for the holidays, I guess they were all off somewhere else being merry with their friends and families! Have you ever been before? Let me know in the comments below. And please share this post with anyone who might be interested! If you visit, post a photo on Instagram with #choosetheadventure. Then I can check it out!